I don’t want to alarm you, but earlier this summer, the North Pole melted. 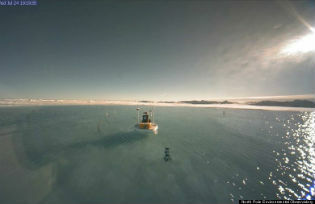 Here’s a picture taken from North Pole Environmental Observatory of a buoy floating on water there. Floating, because it melted. You might have seen headlines about it. But you probably didn’t. There were a few reasons for that. I’ll explain later.